He is a former Royal Marines sergeant, who founded a nonprofit that reunites soldiers with stray dogs and cats they befriended during combat. Meet Pen Farthing, CNN Hero of the Year, 2014. There is no stronger bond between man and dog than that formed during war, Farthing said at the annual tribute show. It all started when Farthing helped to break up a dogfight in the town of Now zad, Afghanistan. The war-torn town was overrun with dogs. But things changed when one of the dogs followed Pen Farthing to his base. As the troop sergeant, I was there to motivate the guys and get them fired up again to go out and do the job. … But no one was doing that for me. My time with this dog was a way of de-stressing. After his tour ended, Farthing went through many difficulties to get his four legged companion Nowzad, to his home in Britain. 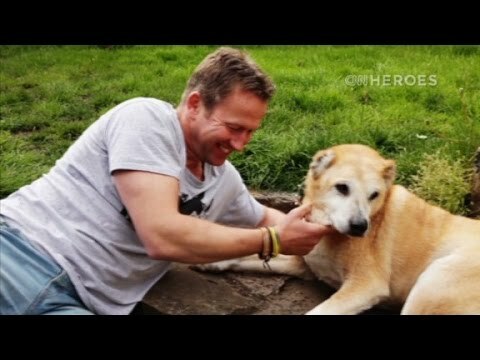 Realizing he wasn’t the only one, he soon founded ‘Nowzad Dogs‘ to help other soldiers whose lives were turned around by the animals they befriended. Now, Nowzad is staffed by 14 Afghan nationals, four of whom are trained veterinarians. The street dogs are vaccinated and cared at the shelter. That protects them against rabies. The efforts have helped the residents by having fewer rabid animals roaming in the streets. Till date, Nowzad Dogs has helped nearly 700 soldiers from eight countries. Pen Farthing’s efforts have made it possible for the soldiers to reunite with the stray dogs they befriended while serving in Afghanistan and on the other hand, helping the animals to find a lovely home, where they get both care and love.